Designation: Facilitating research students in Purbanchal University, Nepal. Biography: Dr. Nawa Raj Subba, a Public Health Expert, has served Ministry of Health in Nepal for three and half decades. In addition to the managerial experience, he has a good experience of managing outbreaks of Hepatitis, Kala-azar, Pandemic Influenza, Avian Influenza, etc. and has conducted public health interventions and campaigns in the districts. He has written books on public health of Nepal and published articles in journals. He received Ph.D. in Health Psychology from Tribhuvan University. His Ph.D. study has explored the traditional and modern maternal and child care practices and effects in Rajbanshi community of Nepal. He is now involved in facilitating public health graduates of Purbanchal University in research activities and conducting training and workshops. Also, contemporary Nepali literature and Nepali music industry recognize him as a lyricist, a poet, or a writer. His books and albums are also available in the markets. The government of Nepal has awarded him Nepal Vidhyabhushan and Gorkhadacchinbahu medals and social organizations also have felicitated with prizes for his works. 1. Health Executive Development Program (Nepal administrative College, Jawalakhel, 2007. 2. A Basic Training Course on District Health Management for Public Health Officer (Ministry of Health) 1995. 3. Training of Trainers (Nepal Health Training Health Centre) 2001. 4. Public Health Emergencies (MoH/WHO) 2005 and others . 5. Research Management (Nepal Health Research Council) 2002. 6. ToT on TB/HIV Collaborative Program Management and PITC in TB Clinical Settings (MoH/WHO) 2008 and others. 1. Morang Innovative Neonatal Intervention (International conference, Bangkok) 2008. 2. Population Management in Nepal (Nanjing University, PR China) 199. 3. A pilot study on Medical Abortion in Jhapa Nepal (Kathmandu) 2010 . 4. Approaches to Population and Development (Purbanchal University/CPAD) 2004 and others. 1. Worked as a team member to prepare curriculum and conduct training program of District Public Officers on Public Mental Health in Nepal, organized by Mental Hospital, Jawalakhel, 2017. 2. Played a pivotal role in lowering NMR from 30 in 2004 to 21 in 2006 per 1000 live births in Morang. 3. Supported refugees' health program and coordinated health service in Maoist cantonment in Jhapa and Morang. 4. Played a leading role in conducting Eastern regional level health assessment with BNMT in 2003. 1. Nepal Vidhyabhushan Ka, 2015. 2. Dirgha Rana Samundra Bam Sanman, 2012. 2. Babar Sing Thapa Sanman 2008. 3. Gurkhadacchinbahu, 1991 and etc. 1. First prize won in First Online Webcam World Poem Competition 2008. 2. Byathith Kavya Banita Puraskar 2014. 3. Mohan Regmi smriti Banni Puraskar 2007 and etc. 1. Working areas are Public Health, literature. 2. 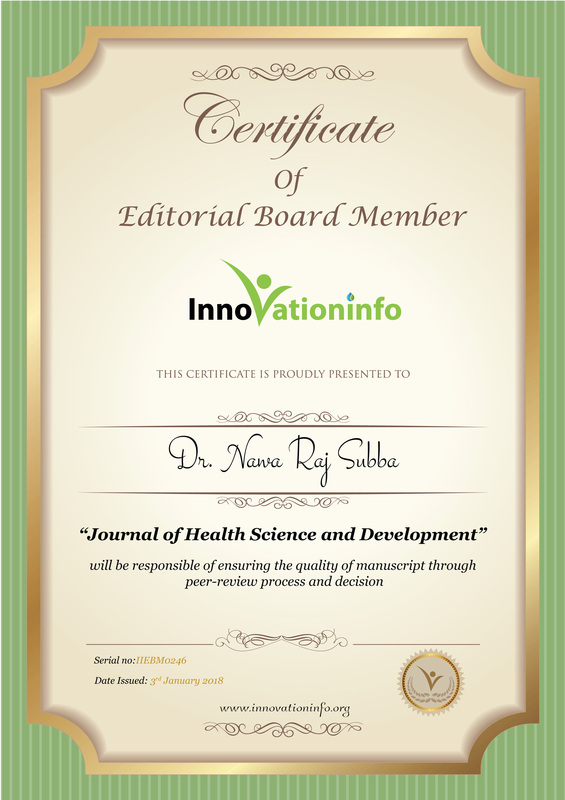 Involved in research, writing and publication. 1. Managing Hepatitis Outbreak in Biratnagar Nepal, 2015. 2. Suicides in Ilam District of Nepal, 2015. 3. Traditional Practices on Mother and Child Health Care in Rajbanshi Community of Nepal, 2015. 4. Postpartum Depression Relating to Smoking and Drinking Habits of Husbands Among Rajbanshi Mothers, 2015. 5. Modification of Delivery Practice in Rajbanshi Mothers of Nepal, 2014. 6. Delivery Practices among Rajbanshi, 2014. 7. Post-Partum Depression among Rajbanshi Mothers, 2010. 8. A study of public health indicators of Morang Nepal by Lot Quality assurance sampling method, 2007. 9. Health Seeking Behavior of Rajbanshi in Katahari and Baijanathpur of Morang District, Nepal, 2004. 10. Demographic Assessment on Vasectomy Clients of Sankhuwasabha Nepal,2003. 1. Traditional and Modern Health Care Practices and Effects on Rajbanshi, 2016. 2. Health Seeking Behaviour of Rajbanshi in Morang, Nepal, 2001. 4. Janaswasthya Abhyas ra Anubhav (Collection of Public Health Articles in Nepali) 2017. 5. Janaswasthya Paataa Baataa Ra Anubhuti (Collection of Public Health Articles in Nepali) 2006. 6. Janaswasthyaka Sawaalharu (Collection of Public Health Articles in Nepali) 2007. 7. Khotangko Swasthya (District health profile of Khotang which was starting in health sector, 1998. 8. Edited Annual Reports of Eastern Regional Health Directorate Dhankuta (2000 to 2003) and Annual Reports of District Public Health Office Morang/ Jhapa (2004 to 2013).